According to a report from John Seach, an eruption at East Epi caldera in early March marked the first reported activity at the largely undersea caldera since 1988. This is the first Bulletinreport on Epi, a group of volcanic centers most conspicuously active at a shallow seamount informally known as Epi B. What follows is a brief summary of the geography and the historical eruptions plausibly or clearly attributed to Epi B (Eissen and others, 1991), leading into a synopsis of recent research and activity. The records of the last century and recent observations suggest that Epi B represents a potential hazard for the inhabitants of the coastal villages of eastern Epi Island (roughly 2,000 people). The island of Epi lies along the Vanuatu island chain between the neighboring islands that include Malekula, Ambrym, and Lopevi to the N, and Efate and Shepherd to the S. The island contains two adjacent Quaternary stratovolcanoes and a smaller cone, as well as the margin of an inferred submarine caldera. The submarine cones Epi A, B, and C lie offshore, 10-16 km NNE from the summit of the island (16.73°S, 168.28°E). The top of Epi B is 13 km NNE of the summit (figure 1). Figure 1. Shaded relief map of the seafloor E of Epi island disclosing Epi A, Epi B, and Epi C seamounts. The map was created from data gathered using a multi-beam swath sounder (on research vessel Alis during the VATATERM cruise) on 14 March 2004 (Ballu and others, 2004). Contour interval is 20 m. Courtesy of IRD. Violent activity between the islands of Lopevi and Epi was reported in 1920 (William and Warden, 1964). In 1953 a major eruption ejected volcanic material to about 100 m above the sea surface and produced rafts of floating pumice over an area of about 1,000 km2. A cone may have formed above water, but it would have been quickly destroyed (Warden, 1967). In 1958 discolored seawater was observed in this area (figure 2; Priam, 1958). Another major eruption was observed in July 1960. Until early 2004, the only recorded evidence of activity following the 1960 eruption was discolored water. Activity at Epi B was also confirmed by the British hydrographic vessel HMS Hydra in 1974, the French research vessel Machias in 1981, the SOPAC cruise of the S.P. Lee in 1984, the Russian vessel Akademik Alexander Nesmayanov in 1990, the French CALIS project using research vessel N.O. Alis in 1991, aerial observations in 1997 (figure 3), and the Australian VAVE project using the research vessel Franklinin 2001. Their collective observations showed that the depth of the cone's summit area remained stationary at -34 m. until early 2004 when Epi Island residents observed explosions and surface disturbances (figure 3). Figure 2. The Epi B area seen emitting a circular region of discolored water in December 1958. Copyright Roland Priam; provided courtesy of IRD. Figure 3. As seen from an oblique aerial perspective, the yellow submarine plume emitted from Epi B as seen in November 1997 (source area at the upper part of the photo). The plume broadened and diffused with distance from the source (towards the bottom of the photo). Copyright Vanair, Andrew Dwyer; provided courtesy of IRD. 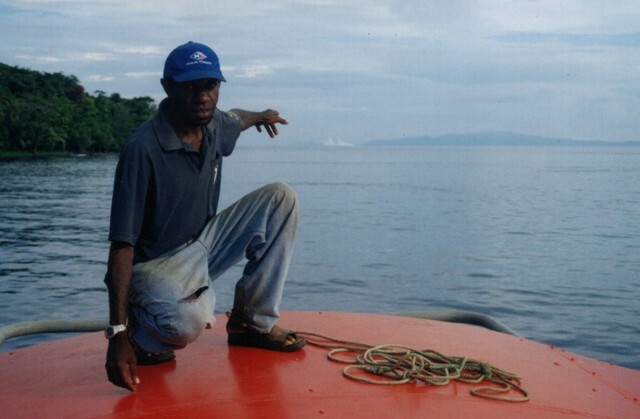 While adjacent to Lopevi, the crew of the fishing vessel Azurreported and photographed an explosion rising above the sea surface on 19 February 2004 (figure 4), prompting Vanuatu's Department of Geology, Mines, and Water Resources (DGMWR) to gather eyewitness accounts from the inhabitants of Epi's very isolated E coast about activity. Eyewitnesses told of explosions heard in early 1999(? ), further explosions and the appearance of floating pumice rafts in March 2002, and an eruption between 16 and 24 February 2004. The latter Epi B eruption was confirmed by the infrasonic recordings of the CEA/DASE (Département d'Analyse et de Surveillance de l'Environnement) geophysics station, located in New Caledonia, more than 600 km away. Figure 4. The 19 February 2004 eruption of Epi B as seen from the fishing boat Azur. The eruption clearly broke the water surface, but is only visible here in the distance as a light-colored disturbance in the direction of the man's arm. Copyright Azur; provided courtesy of IRD. In March 2004 the Institut de Recherche pour le Développement (IRD) undertook a cruise (called VATATERM) aboard their research vessel N.O. Alis.Using the ship's Simrad EM1002 multi-beam sounder, the project produced the first detailed bathymetric map of the area E of Epi Island (figure 1). The Epi A, B, and C cones (Exon and Cronan, 1983; Crawford and others, 1988) have been interpreted by Crawford and others (1988) as being aligned along the N rim of a vast caldera E of Epi. The new map clearly revealed those distinct cones, and a number of smaller cones and craters between them and Epi island's NE coast. The 2004 bathymetric data revealed that Epi B is a ~ 300-m-tall cone with a diameter of ~1.8 km at the base (figure 5). The highest point is on the NW rim of the summit crater, at a depth of -34 m, with a broad rim area around 35-40 m depth extending from the NW around the S to the SE side of the crater. The crater is about 150 m in diameter, the crater floor lying at a depth of 90 m. This crater is breached to the N by a ~60 m wide gap. Figure 5. Detailed bathymetry (5 m contour interval) of Epi B seamount acquired by RV Alis using a multi-beam swath mapper (Simrad EM1002 sounder) on 14 March 2004. For rough scale, the crater is ~ 150 m in diameter and the narrow N-trending canyon is ~ 60 m wide. The VATATERM cruise and the details of creating and interpreting this map are discussed in Ballu and others (2004). Data recorded in 1974 and 1984 indicated that the Epi B crater was open to the S (Exon and Cronan, 1983) or to the SSE (Crawford and others, 1988). The map resulting from a 2001 hydrographic cruise did not show evidence of a summit crater (McConachy and others, 2001). It is not known if these observations represent real modifications to the crater, because the quality of the earlier measurements, using traditional echo-sounders, is questionable. Observations during September 2001. Scientists on the Vanuatu Australia Vents Expedition (VAVE) aboard the RV Franklin (McConachy and others, 2001) investigated the area immediately SE of the Epi B seamount during September 2001. On 18 September a limited echosounding survey was done, along with a single dip CTD/hydrocast followed by a grab. The latter sample returned an 8-cm-thick layer of pumice (dacite-rhyodacite, 69-72% SiO2, in composition) on top of 3 cm of brown mud. The hydrocast found high concentrations of methane gas, 68-93 nl/l, in three samples between 250 and 337 m deep. A weak but definite light transmission anomaly was also seen at the lowest point of the cast. Two days later, on 20 September, a more extensive echosounding survey was made in the area noted on nautical maps as having a shoal at 38 m and discolored water. The survey showed a peak at 34 m depth and two smaller structures to the S around 220 m depth. Comparison of this 2001 bathymetric map with the map created by the 2004 VATATERM cruise (figure 1) shows a correlation of this 34-m peak with the summit of Epi B; the deeper peaks correspond to the smaller cones at about 16.70°S. The team "... obtained a reduction in light transmission at the surface (corresponding to the discoloured water) of around 6% associated with low salinity and higher temperature, another near bottom (below 210 m) of up to 1%, and a narrow upper plume signal at 100 m, with a transmission anomaly of approximately 0.2%." Bottles fired and sampled for geochemical studies revealed a large methane anomaly of up to 80 nl/l near the bottom. References.Ballu, V., Calmant, S., and others, 2004, Campagne VATATERM du N.O. Alis au Vanuatu, mars 2004. Crawford, A.J., Greene, H.G., and Exon, N.F., 1988, Geology, Petrology and Geochemistry of submarine volcanoes Around EPI Island, New Hebrides Arc, inGreene, H.G., and Wong, F.L., eds., Geology and Offshore Resources of Pacific Island Arcs -Vanuatu Region: Circum Pacific Council for Energy and Mineral Resources Earth Science Series, v. 8, Houston, Texas, Circum-Pacific Council for Energy and Mineral Resources, p. 301-327. Eissen, J.P., Blot, C., and Louat, R., 1991, Chronologie de l'activité volcanique historique de l'arc insulaire des Nouvelles-Hébrides de 1595 à 1991: Nouméa, ORSTOM, Rapports Scientifiques et Techniques, Science de la Terre, Géologie-Géophysique, 69 p.
Exon, N.F., and Cronan, D.S., 1983, Hydrothermal iron deposits and associated sediments from submarine volcanoes off Vanuatu, Southwest Pacific: Marine Geology, 52, M43-M52. Garae, E., Todman, S., and Charley, D., 2004, Rapport de l'éruption du 16-24 février 2004 du volcan sous marin "East Epi": Department of Geology, Mines and Water Resources, Section of Volcanology and Geo-Hazards Management, 14 p.
MacFarlane, A., 1976, Annual report of the geological survey for the year 1974: New Hebrides Condominium, 40 p.
Marine et Aéronautique Navale de Nouvelle-Calédonie, 1958, Observations d'un phénomène sous-marin le 7 octobre 1958 à 10 heures locales et le 18 novembre vers 06 heures locales. McConachy, T.F., Yeats, C.J., Arculus, R.J., Binns, R.A., Barriga, F.J.A.S., Beattie, R., McInnes, B.I.A., Madsen, E., Rakau, B., Sestak, S., Sharpe, R., and Tevi, T., 2001, VAVE-2001: Vanuatu Australia Vents Expedition Aboard the RV Franklin, 5-25 September 2001, edited by C.J. Yeats, CSIRO Exploration and Mining Report 881F, Final Cruise Report FR08-2001, 318 p.
Obzhirov, A.I., 1992, Dissolved gases of the near-bottom water layer in the area of Epi Island, Vanuatu: Geo-Marine Letters, v. 12, p. 232-235. Priam, Roland, 1958, November 7 and 13, and December 16, 1958, between 06:30 et 07:00 : reports and slides. R/V AKADEMIK ALEXANDER NESMEYANOV, 1990, Scientific Report, April 4-7, 1990: Institute of Marine Biology, Academy of Science of the USSR, Vladivostok , USSR, 66 p.
Warden, A.J., 1967, The Geology of the Central Islands: New Hebrides Geological Survey Report No. 5, 108 p.
William, C.E.F., and Warden, A.J., 1964, Progress report of the Geological Survey for 1959-1962: New Hebrides Condominium Geological Survey, 75 p.
Information Contacts: Bernard Pelletier, Michel Lardy, and Philipson Bani, IRD, BP A5, Noumea, New Caledonia (URL: http://www.suds-en-ligne.ird.fr/fr/volcan/vanuatu/epi1.htm); Stéphane Calmant, IRD-LEGOS Toulouse, France; Valérie Ballu, IPG Paris, France; Esline Garaebiti, Sylvain Todman, Douglas Charley, Department of Geology, Mines and Water Resources, Port Vila, Vanuatu; Timothy F. McConachy, CSIRO Division of Exploration and Mining, P.O. Box 136, North Ryde, NSW 1670, Australia. 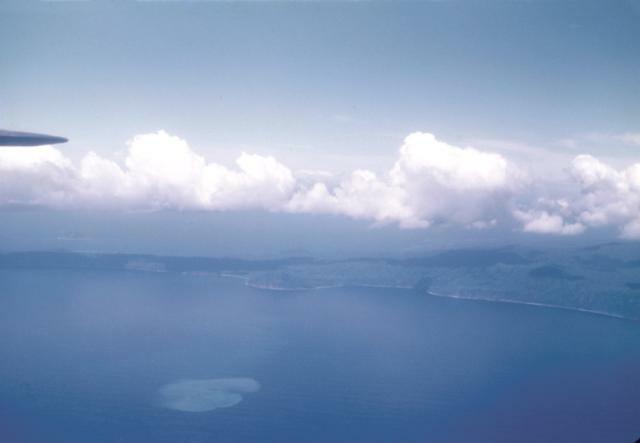 A large caldera, with submarine post-caldera cones active in historical time, lies off the eastern coast of Epi Island. Epi Island itself, located slightly west of the main New Hebrides volcanic arc, largely consists of two Quaternary volcanoes, Mount Allombei on the west and Pomare (Tavani Kutali) on the east. Tavani Ruro, which forms an elongated eastern extension of Epi Island across a narrow isthmus, is related to Kuwae caldera to the east. Pomare volcano is the highest point on the island and has three well-preserved subsidiary cones to the east with youthful summit craters. Pomare volcano is truncated on its eastern side by the largely submarine East Epi caldera, which has been the source of all historical eruptions. Three small submarine basaltic and dacitic cones, known as Epi A, Epi B, and Epi C, are located along the northern rim of the breached caldera. Ephemeral islands were formed during eruptions in 1920 and 1953, and the summit of the shallowest cone, Epi B, was at 34 m below sea level at the time of a 2001 survey. There is no Deformation History data available for Epi. There is no Emissions History data available for Epi. Discolored water rises from the submarine Epi B vent in December 1958. The submarine vent is one of several located offshore of Epi Island. The island, located slightly west of the main New Hebrides volcanic arc, largely consists of two Quaternary volcanoes, Mount Allombei on the west and Pomare (Tavani Kutali) on the east. All historical eruptions have originated from small submarine basaltic and dacitic cones. Ephemeral islands were formed during eruptions in 1920 and 1953. Copyrighted photo by Roland Priam, 1958 (courtesy of IRD, New Caledonia). The February 19, 2004 eruption of Epi B is seen from the shipping boat Azur. The eruption clearly broke the surface, and is seen here as the white area beyond the man's hand. Eyewitnesses told of an eruption at Epi between February 16 and 24, and the Epi B eruption was confirmed by the infrasonic recordings. Copyright photo by crew of Azur, 2004 (courtesy of IRD, Noumea, New Caledonia). There are no samples for Epi in the Smithsonian's NMNH Department of Mineral Sciences Rock and Ore collection. Large Eruptions of Epi Information about large Quaternary eruptions (VEI >= 4) is cataloged in the Large Magnitude Explosive Volcanic Eruptions (LaMEVE) database of the Volcano Global Risk Identification and Analysis Project (VOGRIPA).